Whether you follow the one developed by the U.S Department of Agriculture or another authoritative source, food icons play a crucial role in establishing and sustaining healthy, well-balanced eating habits. They serve as a visual reference for what to eat in what amounts and help you get a variety of nutritious foods into your diet each day. The primary benefit of food pyramids is that they provide dietary guidance in an easy-to-follow visual format. In 2011, the USDA replaced its pyramid with a colorful four-section plate with a cup on the side called MyPlate. It serves as a simpler way to represent healthy eating patterns. The idea is still the same, to illustrate the five food groups -- fruits, vegetables, grains, protein and dairy -- as a means to help you build healthy, well-balanced meals. Many people want to eat healthier but don't know where to start. 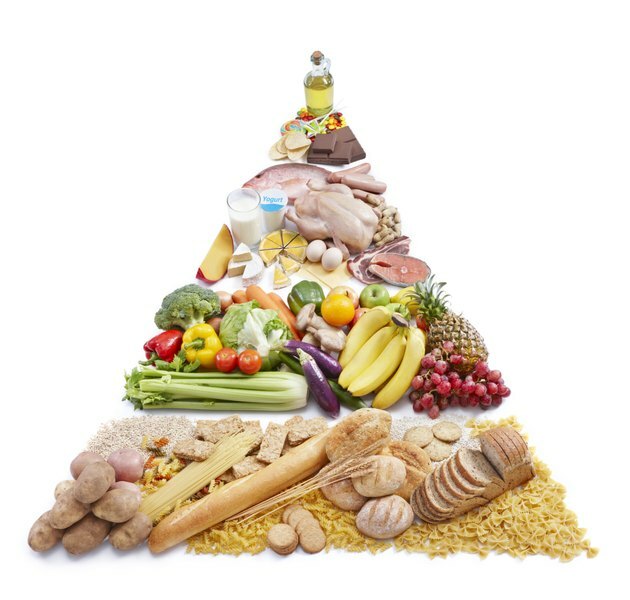 Food pyramids and plates provide guidance on what foods to eat more of and which foods to cut back on. MyPlate encourages you to eat more fruits and vegetables, as the food icon is divided into four main sections, with one quarter for fruits and another quarter for vegetables. Most Americans fail to get enough fruits and vegetables, so filling half your plate with them is a good place to start. Food icons help you to stay on track in getting the recommended daily requirements. Print out MyPlate and post it or another food icon on your fridge, in your office or in a place where you'll see it regularly. It nudges you to eat healthfully and reminds you of which foods you've already eaten and which ones you need to include in your next meal. For example, if your breakfast for the day excluded dairy, MyPlate reminds you to have a snack like yogurt or to include low-fat dairy with lunch. The USDA MyPlate is easy to follow. The goal is to fill half your plate with fruits and veggies, a quarter with protein and the other quarter with grains; the cup reminds you to have a serving of dairy. Faculty members at the Harvard School of Public Health built the Healthy Eating Pyramid and Healthy Eating plate as alternatives to the USDA's MyPlate. The HSPH food icons provide more detailed guidance. Its sections remind you to also have nuts, seeds and beans; choose whole grains; eat two weekly servings of fish; consume healthy oils; reduce red meat; limit sugary drinks, sweets, salt and refined grains; engage in regular exercise; and consume alcohol in moderation if you drink.